A magical and enchanted place, a restaurant with a terrace created inside a natural cave. The Grotta Palazzese restaurant takes its name from the homonymous cave and from the place that was once also called "Grotta di Palazzo". It is an exclusive and atmospheric place, used for parties and banquets since 1700, as evidenced by a watercolor of 1783 by Jean Louis Desprez. The blue of the sea and the sky contrasts with the mysterious atmospheres of the natural cavities. The colors of the day make the beauty of the coastal landscape shine, while those of the evening, at sunset, create unforgettable nuances, in the charm and elegance of the restaurant lights. 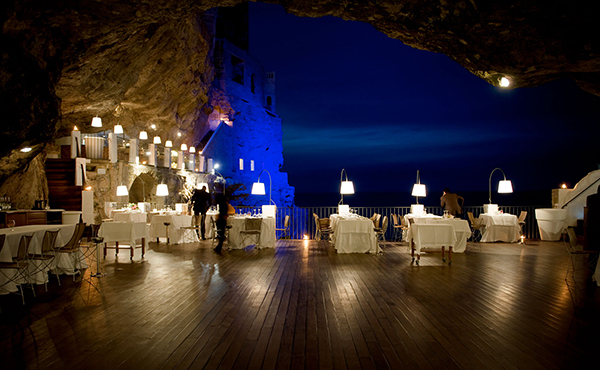 Grotta Palazzese has always been an unmissable destination for those who love finding enchanting places & looking for refined cuisine. Since 1700, travelers from Europe to Southern Italy stopped at this riveting place whose beauty was reported in their chronicles. Since then, the charm hasn't changed, with a touch of modernity that's made the Grotta Palazzese even more welcoming & exclusive. 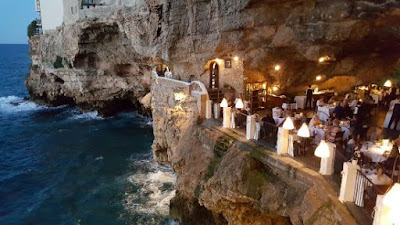 The Grotta Palazzese Restaurant is not only known for the beauty and the uniqueness of the rock in which it is set. In fact, the kitchen is perfect for all those who are looking for exclusivity and refinement. The dishes are always taken care of in every aspect, with the maximum attention to the quality of the ingredients and the harmony of the 'Visual Food'. They are based largely on foods belonging to the Apulian culinary tradition, with addition of aromas, spices and fragrances for a greater refinement of the dishes. 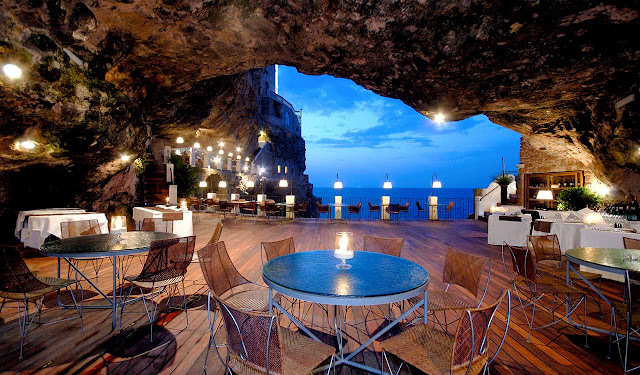 The Grotta Palazzese atmosphere enchants any visitor. Thus, the taste experience becomes unforgettable, with refined delicate flavors & fragrances. The dishes are prepared to offer unique sensory moments. The chef skillfully combines typical foods of the renowned & refined Apulian cuisine with combinations of aromas & spices that make each dish unique. You can choose between two tasting menus (Instinct and Essence) and a vegetarian menu, or you can compose your own lunch or dinner with the "Gran Carte" menu.